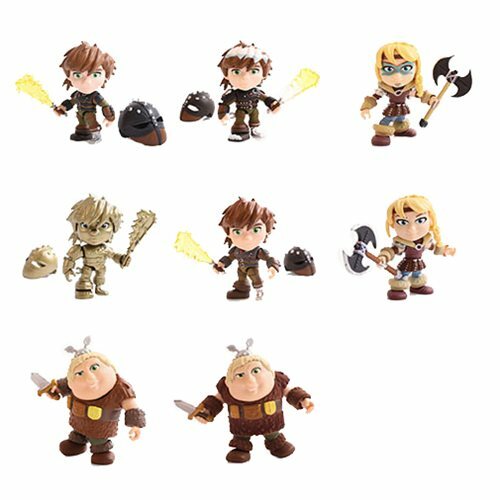 DreamWorks' animated hit, How to Train Your Dragon comes to 3-D life with these great action vinyl figures! This How to Train Your Dragon Heroes and Humans Wave 1 Action Vinyl Figure Display Case contains 12 individually blister-carded action vinyl figures and include the following characters (subject to change): Hiccup, Astrid, Fishlegs, Astrid Racingstripe, Hiccup Night, Fishlegs Flocked, Hiccup Snowy Edition! Rare collector coins are randomly inserted along with the action vinyls. Each mini-figure features over 10 points of articulation. Breakdown not available at this time. Ages 8 and up.